Is there a need for another t-shirt? Can we create the most sustainable products and provide jobs for people in need? Can we make a difference by doing so? Can we create products that make the ones who wear them feel good about themselves? Can we create community and a sense of belonging? The answer to our questions was YES! Our collaboration with Another Textile Company persistently brings two words to mind – sustainability and transparency. These are our shared cornerstone values for the environment, for the people working in textile production, and for the end consumer. An estimated 10 billion plastic bottles are thrown away every single week worldwide, and too many of those cast away bottles end up in our oceans. We have to change this. With Another Textile Company, we discovered a completely ground-breaking method: using fabrics made from recycled polyester (PET bottles) and Fair Trade Certified, organic, recycled cotton waste from previous productions. The result: t-shirts made completely from recycled fibers and certified by the GRS Global Recycled Standard. Our environmental impact while producing our t-shirts is minimal because we only use recycled materials. We save huge amounts of water and the carbon dioxide emissions are reduced to a minimum. The common t-shirt manufacturing process requires 530 gallons (2,000 liters) of water, from the cotton plant to the complete garment, and it uses conventionally grown cotton. Through Another Textile Company’s method with recycled material, the water consumption for each of our t-shirts drops to only half a gallon (2 liters). This makes our recycled t-shirts 99.9% more water efficient! Another Textile Company’s factory only uses green energy and is self-sufficient through its own wind-powered plants. 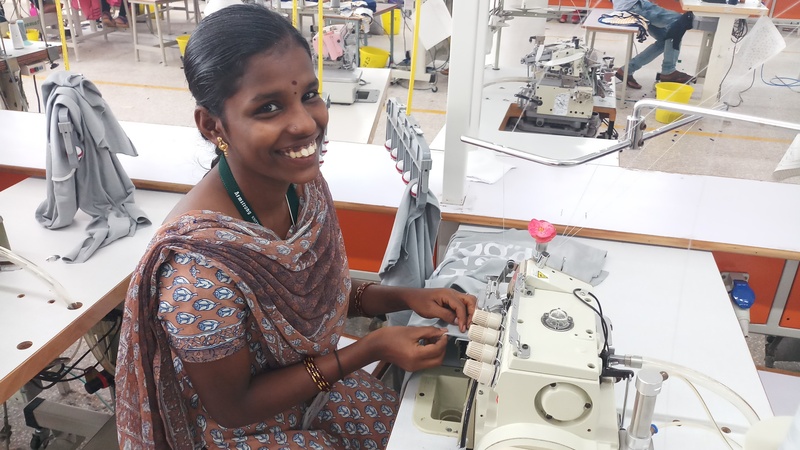 We pay more per item than the factory’s quoted prices, creating a surplus that goes directly to the employees and filling the gap between minimum wages and living wages. All CO2 emissions related to our t-shirts are compensated by supporting Zeromission and its high-quality climate protection projects that contribute to sustainable development in the region of our textile production. This organization also works on reducing or absorbing greenhouse gas emissions associated with projects elsewhere, usually in developing countries. Our climate compensation is mainly done through supporting forest preservation in the Khasi district of India. In this area, women are trained to take care of the microfinance institutional initiatives created within the framework of the Zeromission projects. The PET bottles recycled for our t-shirts are handpicked from beaches and landfills all over India. After gathering the bottles, they are sent to our recycling factory to be washed and ground into plastic flakes. The flakes are then processed into a polyester fiber which gets mixed with cotton fibers, spun into yarn, knitted into fabric, and then sewn as a t-shirt. This whole production chain and its processors are GRS (Global Recycled Standard) and Fair Trade Certified. 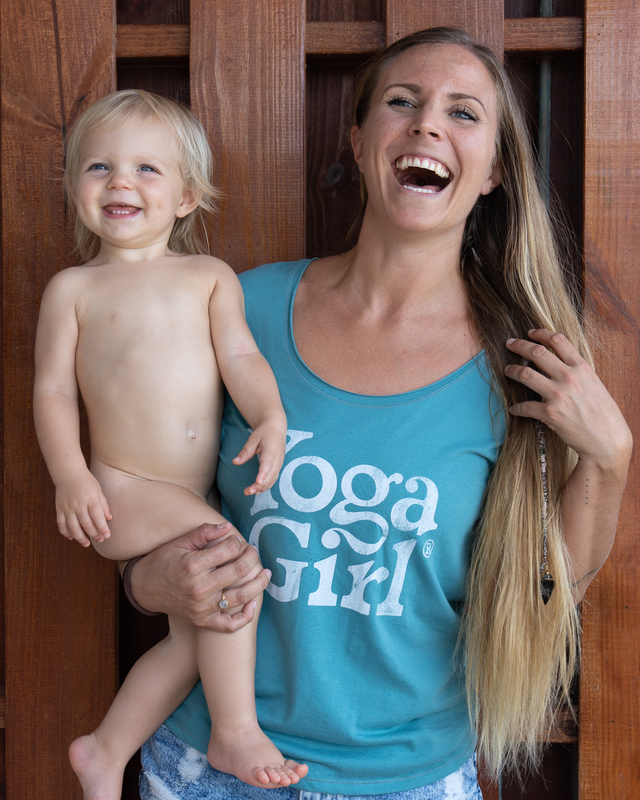 We are really proud of our 1st edition recycled Yoga Girl® t-shirts and we hope that you will love them too. We have two models, SUN that is a more classic t-shirt and MOON that is a more narrow model with a wider neck. Both models fit a Yoga Girl®, no matter gender or size. Find all our first edition t-shirts in our shop! We'd love to see you wearing yours, use the hashtag #iamayogagirl if you post them on social media or send an email to info@yogagirl.com if you will let us use your picture in our channels.